Does your home use a radiant heating system? If so, you know that your boiler is the powerhouse that sends hot water to the radiators located throughout your home. Most residential boilers are either gas-powered, electric-powered, or a hybrid of the two. Your boiler will work for years but, it does have a life expectancy. When that expectancy has expired, it’s time for a new boiler. 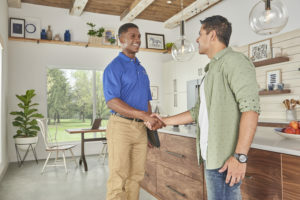 Navien and Carrier are two of the most trusted names in residential boilers, and Front Range HVAC is proud to represent both lines. Whether you need a dedicated boiler for whole-home heating or a combination unit that can also provide domestic hot water, we’ve got you covered. In the world of domestic boilers, efficiency is the name of the game. A more efficient boiler might cost more initially, but the money you’ll save over time will more than make up for the added up-front expense. Many of the Carrier and Navien boilers sold by Front Range HVAC come with an efficiency rating of up to 80%. This means that the boiler is capable of converting as much as 80% of the energy it consumes into heat energy. This translates into a lower energy bill every month. Manufacturer warranty. Carrier and Navien both offer industry-leading warranty programs for the boilers they build. If there is ever a fault with one of their boilers within the warranty period, we’ll work with you to file the claim and remedy the issue. Front Range HVAC service and installation warranty. It’s one thing to be covered by the manufacturer’s warranty, but it’s something else entirely to be covered by the Front Range HVAC warranty for installation and service. When your new boiler is protected by both the manufacturer and the installer, you can rest easy knowing you’re 100% protected against any unexpected problems with your boiler investment. This two-tiered warranty program is one of the many reasons why our customers rave about the residential boilers we sell. At Front Range HVAC, we truly stand behind everyone! If you need a new residential boiler, don’t put it off any longer. Act today and get in touch with the residential boiler sales and installation professionals—Front Range HVAC. Call us today at (303) 942-1372.